BURLINGTON, ON, April 16, 2019 /CNW/ – Rapid Dose Therapeutics Corp. (“RDT” or the “Company”) (CSE: DOSE), a Canadian life sciences company focused on innovative drug and active ingredient delivery solutions, is pleased to announce it has signed a Distribution Agreement with TFB & Associates Ltd. (“TFB”) dated April 4, 2019 (the “Agreement”) granting TFB preferred rights to distribute and sell RDT’s QuickStrip™, an innovative, proprietary delivery technology for nutraceuticals to the Over The Counter Canadian retail market. Under the terms of the Agreement, TFB will purchase, build inventory, market and distribute RDT’s line of QuickStrip™ nutraceutical products across all Canadian retail outlets, including but not limited to, chain and independent pharmacies, mass merchants, health food stores, grocery and convenience stores. RDT’s proprietary QuickStrip™ technology is a Quick, Convenient, Precise, Discreet™ oral, fast-dissolving drug delivery system offering consumers an alternative to pills, capsules, drinks and injections. 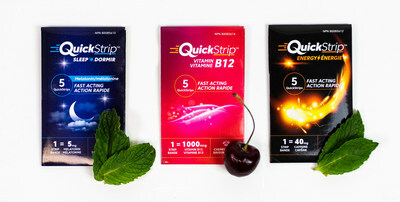 The QuickStrip™ nutraceutical product line delivers vitamin B12, caffeine and melatonin — penetrating the vitamin, energy and sleep consumer markets. TFB is a long-standing privately owned importer and distributor of food, beverage and health care products, bringing a wealth of knowledge, experience and success launching new brands into the retail market. Rapid Dose Therapeutics Corp. is a publicly-traded Canadian life sciences company that provides innovative, proprietary drug delivery technologies designed to improve outcomes and quality of lives. RDT offers Quick, Convenient, Precise and Discreet™ choices to consumers. RDT is focused and committed to clinical research and product development for the healthcare manufacturing industry, including nutraceutical, pharmaceutical and cannabis industries. Within the cannabis sector, RDT provides a turn-key Managed Strip Service Program which enables RDT’s QuickStrip™ proprietary drug delivery technology to be licensed by select partners. RDT’s service based annuity contracts drive recurring revenue which enables rapid expansion into emerging markets — generating value for consumers and shareholders. Rapid Dose Therapeutics is committed to continually create innovative solutions aimed at multiple consumer segments and future market needs — including humans, animals and plants. Certain information in this news release may contain forward-looking information within the meaning of applicable securities laws. Any statements that are contained in this news release that are not statements of historical fact may be deemed to be forward-looking statements. Forward-looking statements are often identified by terms such as “may”, “should”, “anticipate”, “expect”, “potential”, “believe”, “intend”, “will”, “could”, “are planned to”, “are expected to” or the negative of these terms and similar expressions. Statements containing forward-looking information, including, without limitation, in respect of the delivery of equipment and products using the QuickStrip™ product delivery method and the generation of revenues from signed White Label Manufacturing Agreements, express, as at the date of this news release, the plans, estimates, forecasts, projections, expectations or beliefs of RDT management as to future events or results and are believed to be reasonable based on information currently available to RDT management. Forward-looking statements necessarily involve known and unknown risks, including, without limitation, risks associated with general economic conditions; adverse industry events; marketing costs; loss of markets; termination of WLM agreements; future legislative and regulatory developments involving cannabis; inability to access sufficient capital from internal and external sources, and/or inability to access sufficient capital on favourable terms; the cannabis industry in Canada generally, income tax and regulatory matters; the ability to implement its business strategies; competition; currency and interest rate fluctuations and other risks. Readers are cautioned that the foregoing list is not exhaustive. There can be no assurance that statements of forward-looking information, although considered reasonable by RDT management at the time of preparation, will prove to be accurate as there can be no assurance that the plans, intentions or expectations upon which they are based will occur. Actual results and future events could differ materially from those anticipated in such forward-looking statements. Readers should not place undue reliance on forward-looking statements. Forward-looking statements contained in this news release are expressly qualified by this cautionary statement.